Sorry I’ve been MIA for the last week. I reblogged an item from a fellow blogger that I thought was helpful and relevant to my current situation and wedding planning. You try so hard to get everything together and make it look “perfect” for your looming Big Day, but in the end you just have to remind yourself that perfect is what you make of it. Sure the centerpieces won’t be aligned perfectly the way you want them to look, but who’s gonna really notice? If for some reason you get wind that a guest made a snarky comment about decorations should you really let it get to you? Today I explore all the stressful wedding stuff I’ve experienced while getting all my ducks in a row. 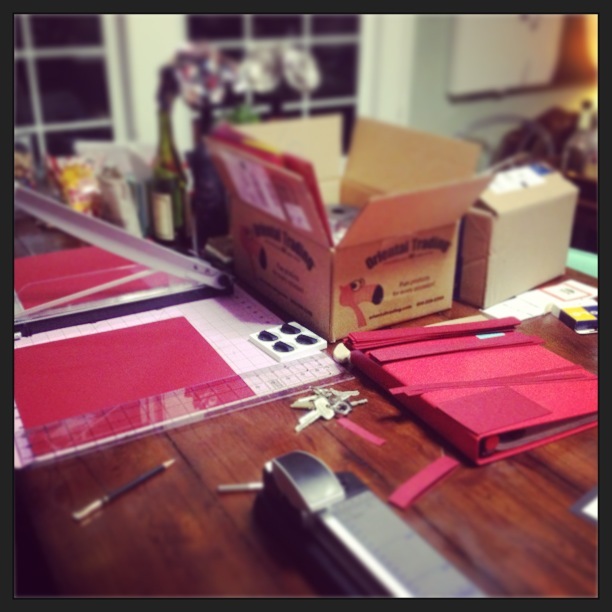 My dining table turned into a craft construction zone while we assembled the invites. My fiance and I had a small conversation last night about our concerns with the centerpieces being too “plain” or looking “empty” because we might not have enough flowers or decorations for the tables. I let him know that if it looks a little simple I’m okay with that. I’d rather be happy with what we have than worry endlessly about what others (or ourselves) are gonna obsess over as looking “perfect.” We are constantly reminding ourselves that we just don’t have the funds to invest it in the little things that are the status quo for other weddings or brides. Case in point, our wedding favors are a perfect example of something we’ve had to readdress as we get closer to the wedding day. At first we wanted to get coffee mugs with a custom image and filled with coffee, tea, and hot chocolate for our guests. Now we realize the custom coffee mugs are not going to be cost effective for us to accomplish. However, our new backup plan is to get paper coffee cups decorated with sleeves, ribbon, and a custom sticker instead. Compromise is everything. You can accomplish your vision with a few adjustments and still feel happy with the outcome of your wedding style. DIY (Within Reason) and ASK for Help! 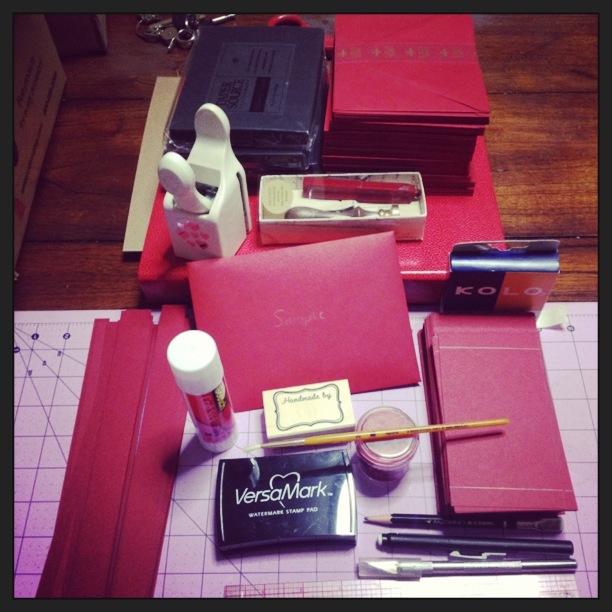 Realizing that stamping all the items for the invites is gonna take a LOT of work! Offbeat Bride Tribe had a great post about how easily DIY projects can consume a lot of your time, and money, without realizing what you signed yourself up for. From the start I had planned on doing a lot of DIY wedding stuff because I wanted to have a hand in creating and designing items over a long period of time (over a year and a half) for our wedding because I take a lot of joy in crafting and creating stuff for my wedding. I also never could have done it by myself, and have been grateful that we have a village of friends who have been kind enough to offer their help, have shown up to help, and continue to be supportive of all the DIY stuff we have created and continue to do for our wedding. Many of them also understand that despite having a relatively large wedding, we are unable to invite everyone due to financial limitations and venue space. All of our friends have been kind enough to give us words of encouragement, advice, tips and tricks on how we can accomplish our dream wedding, and I continue to pick their brains for more help. I always make a point of constantly thanking them in any way I can to show my appreciation for their help and friendship. I took last week off from blogging because I turned my dinning table into a crafting construction zone as I began the process of putting together our wedding invitations. With 2 of my bridesmaids on Spring Break in New York, another in school full-time while working, and another bridesmaid just becoming engaged I took upon myself to call in all my favors. 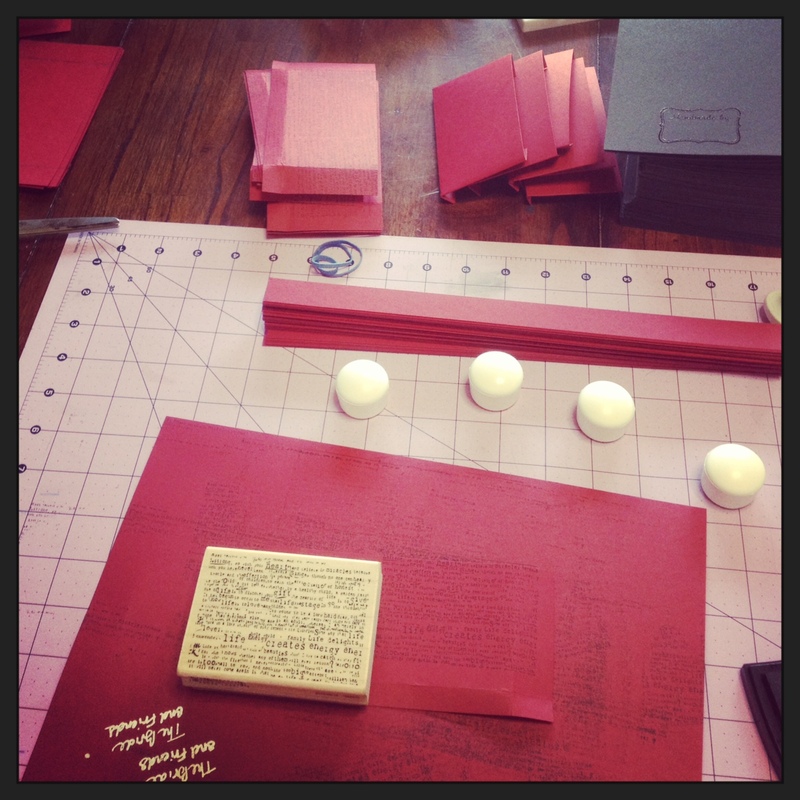 I asked friends who offered to help in the past if they were available to come by (when they had time, I did not dictate when they had to help) and help me construct the wedding invitations. It was amazing and inspiring to see all of the friends who came out to help last week, and within 5 days we had finished putting together every little detail. There are still a few things I need to finish on my end, but those are things I can take my time doing over the course of this week (like numbering the RSVP’s and finalizing the mailing labels) with the help of my fiance. THANK YOU to all my friends, colleagues, and family who have helped us make this wedding become a reality and not just a fantasy!! Getting all my crafting supplies in order so my helpers don’t need to bring anything but their beautiful selves! Early on I had decided I didn’t want to be walked down the aisle by my Biological father because I have a Step-Father who I was closer to, and I didn’t want to be caught up having to explain WHY I was making this decision. I put my foot down (gently) and only told a few close friends and family. Then last Fall, just after becoming unemployed, I accompanied my Mother and Grandparents to the doctor’s office for his final doctor’s visit where they gave the official diagnosis that he was suffering from the early stages of Alzheimer’s. It was heart breaking. Over the last few months he’s gotten worse and my biggest fear is finding out he doesn’t remember me or our wedding. There’s a possibility that he may think I’m my Mother in the confusion. He loses his place in the middle of conversations, still tries to drive off and run errands (they revoked his driver’s license), and now refuses to go to the doctor for anything due to fear they’ll tell him something else is wrong with him. Last month my Mother and I had a long conversation about some of the issues the family has been dealing with, trying to keep him safe, and how he is still in denial about the situation. She asked me, very politely, if I would consider having my Grandfather walk me down the aisle and I immediately accepted. I don’t know how it never occurred to me in the first place! It makes me extremely happy and sad to think that I could share this moment with my Grandfather, and at the same time that he may not remember it, or even live long enough to see us have children. My grandparents had a huge library in their home (before it was remodeled) when I was growing up. My grandfather made all the shelving and cabinets himself. The walls were covered from floor to ceiling in books. My love of books and reading came from spending long summer afternoons pouring over my Grandfathers books, my mother reading me bed time stories, and my Uncle’s fascination with outer space and their collection of Astronomy books. Our wedding has a paper/book theme due to my Grandfather’s library and his love of books has rubbed off on me over the years. One Christmas I gave him a set of history books that he loved, and my Grandmother was a little annoyed and said, “Now he’s gonna be up all night reading and ignoring me!” She doesn’t like reading much. 🙂 My Aunts and uncles use to tell stories about me reading out loud to them from one of many books, even though I wasn’t old enough to read, or understand was the book was about.